Colourful Backgrounds with Cosmic Shimmer Shakers! In today’s post we’re sharing how to make 3 Colourful Backgrounds with Creative Expressions Cosmic Shimmer Shakers! Shimmer Shakers are colourful dry pigment/mica powders that are reactive to water. The effects they create when combined with water are GORGEOUS! You can paint, create custom colour sprays, sprinkle on your cardstock, or even create galaxy backgrounds when sprinkled on black cardstock. They leave a luminous, saturated shimmer and sparkle on your paper. 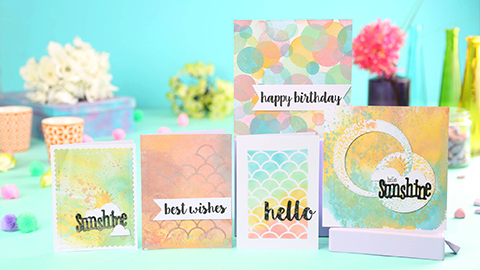 They’re perfect for cards, mixed media, and creative journaling! To paint with Cosmic Shimmer Shakers all you have to do is sprinkle your desired colours on a craft mat. Activate the powders by adding a little bit of water. In the video, Janette added water with a waterbrush. She painted her cardstock and heat set the colours between layers with a heat tool. She was left with a shimmery watercolour-like effect that did not smudge or budge! To create galaxy backgrounds with Cosmic Shimmer Shakers, just grab a piece of black cardstock, sprinkle your powders, and then activate by spritzing a little water. Dry the water with a heat tool and voila! An instant galaxy! Now in case you’re wondering how these compare to the Cosmic Shimmer Pixie Powders, they are similar except that Pixie Powders are dye/mica based, whereas the Shimmer Shakers are pigment/mica based. So you get more vibrant colours with the Shimmer Shakers that can be used on darker coloured cardstock and they also have a brighter sheen and shimmer. Regardless, they’re both great products by the same company, and Craftstash carries a large selection of both! Win, win! Distress Oxide Ink – create textured backgrounds for your cards!